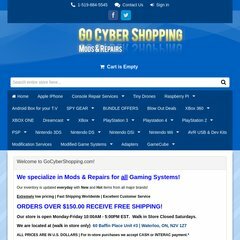 www.Gocybershopping.ca - GoCyberShopping.com - Mods and Repair Specialists! Topics: Modified Games Systems, Nintendo Wii, & Nintendo Ds. The programming language environment is PHP/5.3.10. Momentous.ca Corporation (Ontario, Ottawa) is the location of the Apache/2 server. Its 2 nameservers are dns.internic.ca, & dns2.internic.ca.